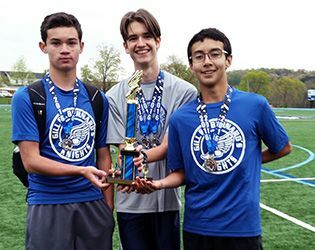 Yesterday, Middle School track and field athletes competed in the annual Silver Spike Invitational, which Gill St. Bernard's hosts each spring. Despite cold and rainy conditions, several schools made their way to campus for the meet, including Pingry, Princeton Day School, Morristown Beard and Newark Academy. Eleven schools took part in the girls' competition and ten in the boys' events. Highlights of the day included the boys' team garnering second place among ten teams! Notable individual performances included Nic DeMarco '20, who took first in the long jump and second in both the 100M and the 200M; Will Soucie '20, who claimed first in the high jump and third in the 100M hurdles; Lloyd Wright '20, who took second in the discus; and Lucas Zuanic '20, who finished third in the 200M. In addition, the boys' 4x100 team of Pierson Chan '20, Sohan De Silva '21, Wright and Zuanic garnered second place in that event.